The three officials—Carl Gershman, Daniel Twining, and Kenneth Wollack—told Congress about their long-term efforts to empower the opponents of U.S. enemies and boasted about their ability to change foreign governments. They said that they had recently helped their political allies gain political power in Malaysia, acknowledged that they have helped train thousands of activists in Nicaragua, and speculated about the potential to create new governments in China, Russia, and North Korea. All three men strongly defended their activities, insisting that they are critically important to the advancement of democracy in the world. Gershman is the president of the National Endowment for Democracy (NED), a U.S. taxpayer-funded nonprofit created by the U.S. government in 1983. As the president of NED, Gershman oversees the issuance of grants to its political-party-associated organizations, including the International Republican Institute (IRI), which is headed by Twining, and the National Democratic Institute (NDI), which is headed by Wollack. Facing skepticism about their work from the Trump administration, which views the organizations as unnecessary expenses and wants to cut their funding, Gershman and his colleagues provided Congress with a broad overview of how their work affects the world. They defended their ongoing operations, trying to persuade Congress that they should continue to receive funding. Ultimately, the three officials revealed how they are helping the U.S. government interfere in numerous countries around the world. The general strategy of NED is to empower like-minded activists to build new political movements in their home countries. NED helps these activists become influential political actors, often with the goal of creating new possibilities for political change. Officials typically describe their approach as one of “democracy promotion.” They argue that they are helping democratic forces introduce democratic politics into countries ruled by authoritarian leaders. The NED has also been active in Nicaragua, where opposition forces are organizing major protests against the Nicaraguan government. The protesters are trying to bring down the government of Nicaraguan President Daniel Ortega, a popular leftist leader who has been in power since 2007. “We have been working on youth leadership programs and have worked with more than 8,000 youth on a very extensive coursework and academies to develop U.S. engagement,” Wollack said. 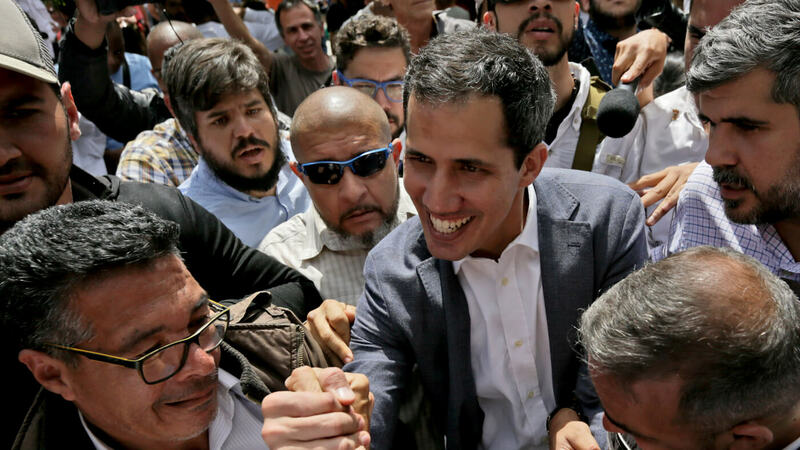 Although Wollack denied that the organizations are training their grantees for the purpose of overthrowing Ortega, Gershman indicated that regime change is the ultimate goal. “Time for him to go,” Gershman said, referring to Ortega. The three officials also cited many additional opportunities to influence governments around the world. They are especially excited about opportunities in Armenia, where a major social movement recently ousted a government backed by Russia. Gershman saw potential for a similar outcome in North Korea. “This is an eroding totalitarian system, so we shouldn’t give up hope on the possibilities for internal change,” he said. Although Gershman said that the U.S. government will initially respond to challenges from China with a mix of military, economic, and geostrategic power, he insisted that the long-term solution could be found in the “unhappy people” who oppose the Chinese government. “We have to not give up on the possibility for democratic change in China and keep finding ways to support them,” he said. The open talk of U.S. meddling in other countries around the world was so commonplace that the U.S. mass media spent no time covering the hearing, even though the speakers did encounter some pushback. Not all members of Congress are on board with the programs. Congressman Dana Rohrabacher (R-CA) made the strongest critique, insisting that U.S. meddling destabilizes countries while creating more problems for the United States in the long run. Rohrabacher blamed recent U.S. meddling for destabilizing Ukraine. He argued that the U.S. involvement in national protests that led to the downfall of the government of Viktor Yanukovych in February 2014 prompted the subsequent Russian invasion of the country and the war that continues there today. “I don’t believe the Russians would have invaded Ukraine had we not arrogantly involved ourselves to overthrow that democratically elected government in Ukraine,” Rohrabacher said. Rohrabacher also insisted that the U.S. should support dictators. He singled out Egypt, saying that the country should continue to be ruled by General Abdel Fattah el-Sisi, the military dictator who gained power by overthrowing the country’s first democratically elected government in 2013. “I know I am making everybody mad at me, but I had to say it,” Rohrabacher commented. Faced with Rohrabacher’s criticisms, the remaining participants in the hearing made some effort to counter his arguments but otherwise said very little, preferring instead to blandly praise NED for performing admirable work by promoting democracy around the world. The general feeling in Congress is that the U.S. government should continue to fund the work of the NED and its affiliated institutes. Most members of Congress view the organizations as important assets in the U.S. government’s toolkit, believing they play an important role in U.S. global strategy.